Mercury has always been a bit of an oddball as the only planet in the Solar System that does not follow a basically circular orbit. Earth and Mercury are the only two planets in the Solar System to have a magnetosphere. "We are assembling a global overview of the nature and workings of Mercury for the first time," remarked MESSENGER principal investigator Sean Solomon of the Carnegie Institution. "and many of our earlier ideas are being cast aside as new observations lead to new insights. Our primary mission has another three Mercury years to run, and we can expect more surprises as our Solar System's innermost planet reveals its long-held secrets." The spacecraft's instruments are making a complete reconnaissance of the planet's geochemistry, geophysics, geologic history, atmosphere, magnetosphere, and plasma environment. MESSENGER is providing a wealth of new information and some surprises. For instance, Mercury's surface composition differs from that expected for the innermost of the terrestrial planets, and Mercury's magnetic field has a north-south asymmetry that affects interaction of the planet's surface with charged particles from the solar wind. Tens of thousands of images reveal major features on the planet in high resolution for the first time. Measurements of the chemical composition of the planet's surface are providing important clues to the origin of the planet and its geological history. Maps of the planet's topography and magnetic field are offering new evidence on Mercury's interior dynamical processes. And scientists now know that bursts of energetic particles in Mercury's magnetosphere are a continuing product of the interaction of Mercury's magnetic field with the solar wind. "MESSENGER has passed a number of milestones just this week," offered Sean Solomon. "We completed our first perihelion passage from orbit on Sunday, our first Mercury year in orbit on Monday, our first superior solar conjunction from orbit on Tuesday, and our first orbit-correction maneuver on Wednesday. Those milestones provide important context to the continuing feast of new observations that MESSENGER has been sending home on nearly a daily basis." Images obtained with MESSENGER's Mercury Dual Imaging System (MDIS) are being combined into maps for the first global look at the planet under optimal viewing conditions. New images of areas near Mercury's north pole orbital show that region hosts one of the largest expanses of volcanic plains deposits on the planet, with thicknesses of up to several kilometers. The broad expanses of plains confirm that volcanism shaped much of Mercury's crust and continued through much of Mercury's history, despite an overall contractional stress state that tended to inhibit the extrusion of volcanic material onto the surface. Among the fascinating features seen in flyby images of Mercury were bright, patchy deposits on some crater floors, but they remained a curiosity. New targeted MDIS observations reveal these patchy deposits to be clusters of rimless, irregular pits with horizontal dimension from hundreds of meters to several kilometers. These pits are often surrounded by diffuse halos of higher-reflectance material, and they are found associated with central peaks, peak rings, and rims of craters. "The etched appearance of these landforms is unlike anything we've seen before on Mercury or the Moon," says Brett Denevi, a staff scientist at the Johns Hopkins University Applied Physics Laboratory (APL) in Laurel, Md., and a member of the MESSENGER imaging team. "We are still debating their origin, but they appear to have a relatively young age and may suggest a more abundant than expected volatile component in Mercury's crust." The X-Ray Spectrometer (XRS) has made several important discoveries since orbit insertion. The magnesium/silicon, aluminum/silicon, and calcium/silicon ratios averaged over large areas of the planet's surface show that, unlike the surface of the Moon, Mercury's surface is not dominated by feldspar-rich rocks. XRS observations have also revealed substantial amounts of sulfur at Mercury's surface, lending support to suggestions from ground-based observations that sulfide minerals are present. This discovery suggests that Mercury's original building blocks may have been less oxidized than those that formed the other terrestrial planets and could be key to understanding the nature of volcanism on Mercury. MESSENGER's Gamma-Ray and Neutron Spectrometer detected the decay of radioactive isotopes of potassium and thorium, and researchers have determined the bulk abundances of these elements. "The abundance of potassium rules out some prior theories for Mercury's composition and origin," says Larry Nittler, a staff scientist at the Carnegie Institution. "Moreover, the inferred ratio of potassium to thorium is similar to that of other terrestrial planets, suggesting that Mercury is not highly depleted in volatiles, contrary to some prior ideas about its origin." MESSENGER's Mercury Laser Altimeter has been mapping the topography of Mercury's northern hemisphere in detail. The north polar region, for instance, is a broad area of low elevations. The overall topographic height range seen to date exceeds 9 kilometers (5.5 miles). Previous Earth-based radar images showed that around Mercury's north and south poles are deposits thought to consist of water ice and perhaps other ices preserved on cold, permanently shadowed floors of high-latitude impact craters. MESSENGER's altimeter is measuring the floor depths of craters near the north pole. The depths of craters with polar deposits support the idea that these areas are in permanent shadow. The geometry of Mercury's internal magnetic field can potentially allow the rejection of some theories for how the field is generated. The spacecraft found that Mercury's magnetic equator is well north of the planet's geographic equator. The best-fitting internal dipole magnetic field is located about 0.2 Mercury radii, or 480 km (298 miles), northward of the planet's center. The dynamo mechanism responsible for generating the planet's magnetic field therefore has a strong north-south asymmetry. As a result of this north-south asymmetry, the geometry of magnetic field lines is different in Mercury's north and south polar regions. In particular, the magnetic "polar cap" where field lines are open to the interplanetary medium is much larger near the south pole. This geometry implies that the south polar region is much more exposed than the north to charged particles heated and accelerated by the solar wind. The impact of those charged particles onto Mercury's surface contributes both to the generation of the planet's tenuous atmosphere and to the "space weathering" of surface materials, both of which should have a north-south asymmetry. 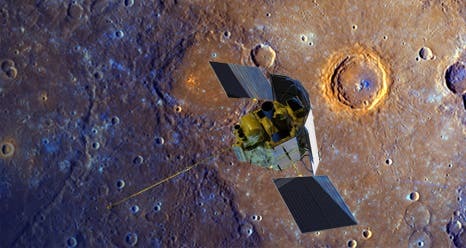 One of the major discoveries made by Mariner 10 flybys of Mercury in 1974 were bursts of energetic particles in Mercury's Earth-like magnetosphere. Four bursts of particles were observed on the first flyby, so it was puzzling that no such events were detected by MESSENGER during any of its three flybys. "While varying in strength and distribution, bursts of energetic electrons—with energies from 10 kiloelectron volts (keV) to more than 200 keV—have been seen in most orbits since orbit insertion," said MESSENGER Project Scientist Ralph McNutt, of APL. "The Energetic Particle Spectrometer has shown these events to be electrons rather than energetic ions, and to occur at moderate latitudes. The latitudinal location is entirely consistent with the events seen by Mariner 10." e local magnetic field. Another is induction brought about by rapid changes in the magnetic field, a process that follows the principle used in generators on Earth to produce electric power. The mechanisms at work will be the studied over the coming months.